I go to the woods, the forest, the place where trees grow. 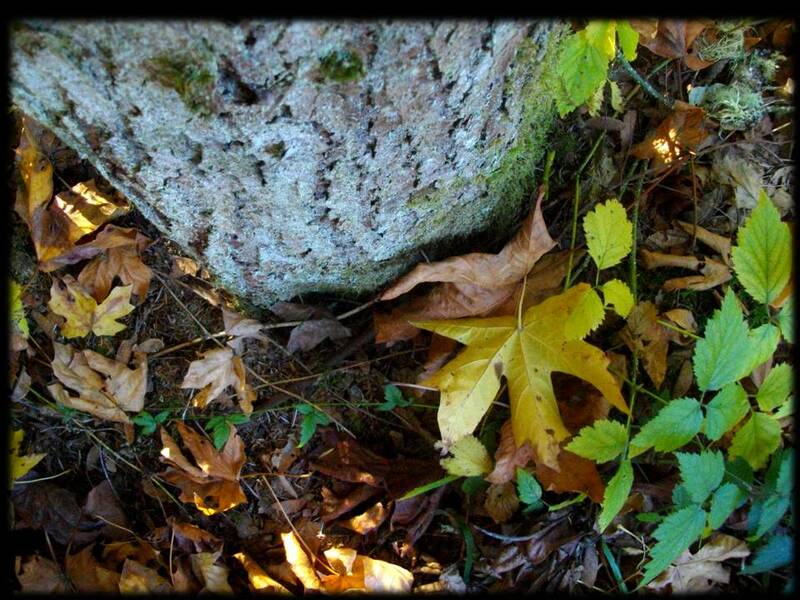 I go there to find the leaves of maple trees, the loam of their rotted bodies. I need to cart these to the garden. I’m trying. The trees are tightly spaced, and the leaves packed hard between the tangled tree roots. What should I do with that? Make a metaphor? Pretend I know what I’m talking about? I go to the maples and rake the leaves into piles. I scoop them up into my arms as best I can, first with the broken rake, then without, trying to keep the dry husks from falling through the cracks in my folded arms as I walk to the edge of the field where the wheelbarrow waits. The withered leaves are nothing really – weightless they drift away, tumble, fall. Like a waterfall maybe? Next I’ll talk about butterflies and everyone will roll their eyes at the cliché. But there we are in the movie theater with the second and third graders, a whole school full. They rise up, the children, almost in unison and try to grab the butterflies as they came off the screen, fooled by the 3D. The children, they spin and giggle. I wish I was there in the mountains, in the forest, high in the dry and cool Sierra Madre, even with all these children, going where the butterflies go for the winter, hanging as they do from the fir trees. In the evenings now the lights come on early. The rectangle of yellow cast from the window illuminates the withering lawn, nearly reaching the garden where little garlic bulbs sit in the dirt, waiting for the growing to begin. The garlic I planted, while leaves drifted about, while a warm wind talked through the alder trees. All day I push the wheelbarrow back and forth from woods to garden, garden to woods. I pile leaves and loam from the forest floor onto the garden. There are cracks in my arms – places where leaves fall through, though enough make it to the wheelbarrow, to the garden, to cover the dirt. Grow, I admonish. Grow. But I am a poor gardener, few zucchini come of my soil, a little lettuce, a smattering of root vegetables. Garlic. But how much does one need? Is a smattering enough? We’re all shortchanged really, even my young son, who after dinner asks to watch TV. Eat slowly he says, it will give me more time. Hardly. There is not much time to give. A few minutes here, a few minutes there. Cherish the moments, I’m told. I’ve probably mucked it all up anyway. The garlic, the zucchini, the lettuce, is not what I worry over. My son, he’s grabs at the butterflies too, but can’t catch any. What will we do if we get one? If we don’t let go? There is a tiny beetle on the bathroom floor, here in the house. Every time I come into the bathroom it’s on its back again, black body like a stain on the floor, bright against the light wood. Every time I see the beetle is like new , as if I should gasp again, bend over and see what it is on the floor, see the little legs wiggle in the air, stuck as he is on his back. I bend down and examine the blackness of the body, the panic of tiny legs. I’m here to help, I say, remember? As if I’ll always be there. Odd isn’t it? I almost step on him again before someone thinks to put him outside, in the grass, in the warm sun, where he crawls off before darkness comes. What if I wanted to crawl off into the grasses? What if I wanted to follow the butterflies to the fir trees? Have your time, I say. Use it as best you can, there isn’t that much afterall. Watch TV if you want, grasp at butterflies, help the beetle. Things will slip through your arms. I won’t get very far before I need a nudge. Will you nudge me? Will you help carry the leaves? Will you go into the forest and look about? Tell me I haven’t mucked things up already. I see us in the movie theater, leaning forward into space, trying to catch the butterflies, the fake ones that come out of the light. The ones we bend over the edge of the railing to catch, the ones that disappear before we can touch them, the ones that fly off and leave us grasping at nothing, staring into dark, wondering how they slipped so quickly away. I’m thunderstruck. I can think of no other word to describe how your writing in the piece made me feel. Every word has meaning; nothing in wasted; the imagery and emotions are compelling. What skill it took to weave the images of collecting leaves with those of children reaching for 3-D butterflies, with the beetle on its back, dinner with you son, and gardening. All of them loaded with emotion: self-doubt, futility, the fleetness of life and our resulting insecurities about, the ongoing and passive intricacies of nature. Wow. I’ve read your words twice already and will do so again. Thank you, my friend. Thank you! And my apologies for so long in responding. Someday I will figure out how to better balance writing and life. This is a piece I enjoyed writing and am fond of. I’m so very glad to hear it resonates. And I am a very bad gardener – I have managed to kill the mint I’ve had growing in pots – but the garlic is good – again this year – just starting to pull it up.